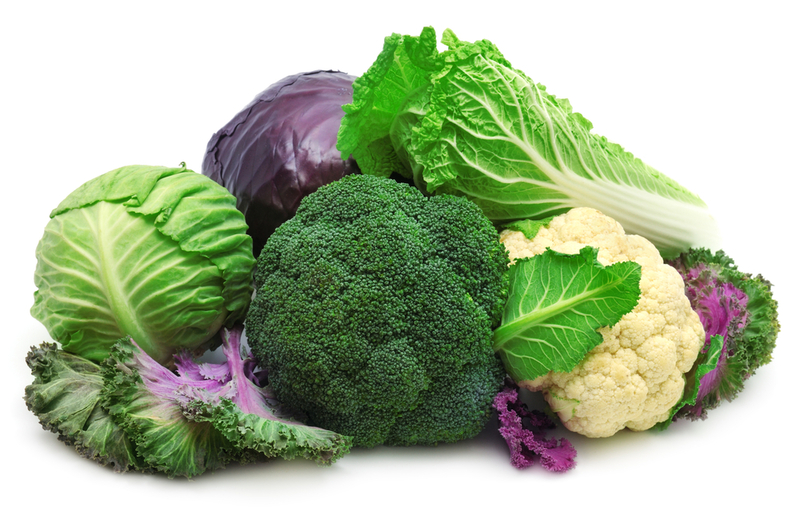 Cruciferous vegetables are powerful, health promoting foods. In addition to their superstar status for high concentrations of vitamins and minerals, they contain compounds that have been well studied in their ability to calm inflammation and promote detoxification. According to the American Institute for Cancer Research [AICR.org], cruciferous vegetables reduce the risk of cancer more than other vegetables. This may be due to their high concentrations of sulfur-containing glucosinolates [you can thank the sulfur for the “eggy” smell of vegetables in this family.] Ample amounts of antioxidants may also contribute to crucifers’ disease-fighting power. Lightly steam, blanch, roast, or stir fry for best retention and availability of these compounds – avoid overcooking. Broccoli: The delicate florets of this vegetable make it irresistible. Like most crucifers, its strong flavor mellows with cooking. We love it lightly steamed and added to salads, roasted crispy as a side dish, or chopped and added to stir fries. You can slice broccoli through the stem to create “steaks” like we did here in this 4-ingredient recipe for Broccoli Steaks with Spicy Yogurt Sauce. Cauliflower: It’s impossible to ignore the ubiquity of cauliflower these days – it’s grated to make “rice”, puréed to make pizza crust, and blended into soups for a creamy texture. The reason it does so well across a variety of uses is because, once cooked, its bitterness mellows and it takes on the flavor of anything you pair with it. This Creamy Cauliflower Soup, a Living Plate signature recipe, is the perfect example. Kale: For some, kale is an acquired taste. Its incredible cellular integrity is responsible for the waxy, chewy mouth feel. Shredding and massaging raw kale significantly improves the experience, as does cooking the vegetable. If eating a trough-sized kale salad isn’t your thing, chop and add it to soups, stews, or slow-cooker dishes. It really holds up to the heat and will become soft and sweet. We love this 4-ingredient recipe for Garlicky Kale with Chickpeas. Brussels sprouts: These cute little packages deliver big on nutrition, flavor and texture. This time of year you’ll see Brussels sprouts often on our meal plans. This Sheet Pan Maple-Mustard Chicken with Brussels Sprouts is the answer for anyone who is busy [is anyone NOT busy?] and wants to enjoy a healthy dinner with minimal prep time. The touch of maple syrup is a great complement to the Brussels sprouts. Arugula: Who knew arugula was a cruciferous vegetable? If you let arugula overgrow in your garden, you’ll see the telltale signs that this is a broccoli relative – little florets will appear at the end of the shoots. This is one of the easiest crucifers you can consume as it is readily available pre-washed in the grocery store and does not require cooking. Its spicy leaves make it the perfect base for a salad loaded with vegetables and dressed with a clingy vinaigrette, like in this recipe for Arugula Salad with Butternut Squash.